Thank you for choosing to visit our web site. We hope that it's interesting and easy to explore, and that you'll find what you're seeking here. 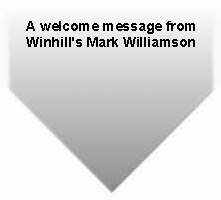 Winhill is a small business serving other small businesses and individual computer users in Western Pennsylvania. Our mission is to provide you with the best possible combinations of quality, service, and value in personal computer equipment, upgrades, software, and networking. To best meet your equipment needs, we carefully custom build quality systems, configure them with the software you choose, and install them for you. We can also upgrade your existing systems for you, using faster processors, more memory, bigger disk drives, etc. Please call to discuss. We obtain the best values in business software packages to complement our custom built systems. We also offer personal productivity, general interest, and entertainment programs. Many businesses in this area appreciate the on-site support and assistance that we can provide. This includes trouble-shooting and solution development, as well as maintenance, repair, and upgrading. We have considerable experience in installing and expanding computer networks, and provide very cost-effective data and voice wiring services. If you can't find what you're looking for here on our web site, please e-mail or call with your requirements. I'll be happy to help you, personally. On the other hand, if you see what you need and want to discuss details or ask questions, I'll take the time to explain what we offer. Either way, I'll work out a great deal for you. Thanks again for visiting! I appreciate it.